Cheeky title, I know. But with so much horror to read and watch out there, Gothic can get overlooked. It’s called ‘quiet’ horror for a reason—you won’t find much blood splatter and gore, if any at all—but it packs its own brand of (usually spiked) punch. For me, Gothic is more creepy and unsettling: You think you’ve gotten everything there is to get from the story, but then something happens—maybe a creak of the floorboard or the frantic flapping of bird wings—to bring those shivers rushing back. Add the American South as a setting and you’ve got the Southern Gothic sub-genre. In this form of literature, the outcast is a fixture. Weird, unusual behavior by characters is noted and known by all, but there is a sense of welcome prevalent throughout. Because in he South, we don’t hide our craziness, we parade it on the front porch and serve it iced tea. I love this style of horror, and I wanted to add my take on it to the great works that already exist. My short story collection, Spook Lights, was born from some of my experiences, including the spells and hexes of the rootworkers—Southern hoodoo magic users—I grew up around. 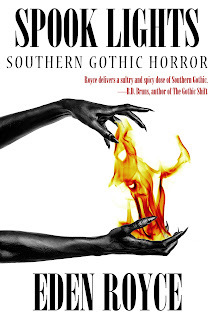 It’s rare to see Southern Gothic horror like my collection, Spook Lights, in which the main characters are people of color. Many writers of Southern Gothic literature relegate people of color to the sidelines in their tales. They are fleeting figures that slip through the lives of their main characters, doling out advice or wisdom that someone else uses to save the day from evil. Spook Lights brings you tales from the point of view of these formerly underrepresented people, especially in horror circles, and lets you see that maybe we aren’t so different after all. One difference between traditional Gothic and Southern Gothic stories is the portrayal of women. 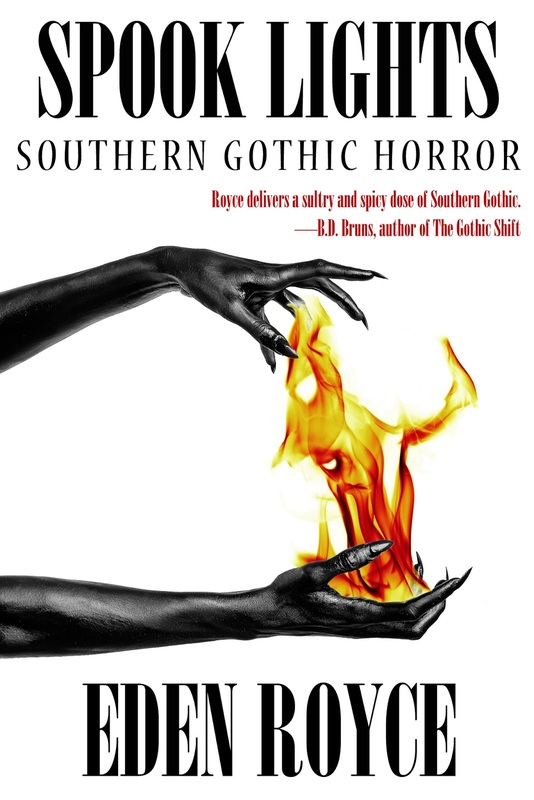 While traditional Gothic has fainting heroines who are always a heartbeat away from going mad, Southern Gothic women are made of a tougher cloth. Women in Southern Gothic fiction are revered, sometimes feared, for their no-nonsense way of dealing with this world—and the next. That has always resonated with me. Something else you’ll find in Spook Lights is conjure magic, a fixture of Southern Gothic, called ‘root’ in my hometown of Charleston. Hollywood has a tendency to only show evil and darkness when it refers to conjure. My great-aunt did her share of love potions and luck papers for appreciative locals. I love to see conjure magic used in non-destructive ways as it shows a universal theme running through magics of every culture: that we can change our world for the better. Southern Gothic is steeped in folklore, oral history, suspense, and local color. First popularized in the 19th century by short story crafters like Edgar Allan Poe and Nathaniel Hawthorne, modern Southern authors are embracing the South’s tradition of storytelling and including a more varied cultural history. Incorporating the cultures and beliefs of various peoples makes storytelling more fulfilling and more resonant. Authors are now more comfortable telling their stories of the South and her difficult history—wars, slavery, segregation—pairing it with a new voices of inclusion and understanding to ensure her legacy will be one all people can enjoy. Eden is also one of the writers for The 7 Magpies project, a first of its kind: a short horror film anthology written and directed entirely by black women. 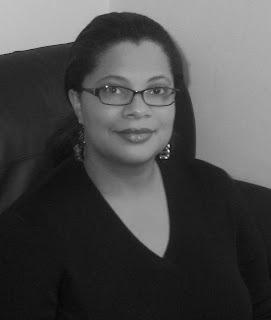 She is also the horror submissions editor for Mocha Memoirs Press where she conceived and edited The Grotesquerie, an anthology of twenty-one horror short stories written by women. She also writes a regular feature for Graveyard Shift Sisters, a site dedicated to purging the black female horror fan from the margins, where she interviews black female authors and reviews their latest work. When she’s not writing, Eden loves roller-skating, watching quiz shows, and perfecting her signature dish for Masterchef. Learn more about Eden’s brand of horror on her website edenroyce.com. Have you read Spook Lights?